If he wants more profit from his sales, what do you suggest him to sell more of chocolate or more biscuit packets? 2 A shop keeper buys 1000 coconuts by paying Rs 6000. Of these 100 coconuts were spoiled. If he sells remaining coconuts at Rs 5, did he incur loss or profit? Definition: ‘Percentage’ is a fraction with denominator as 100 and is represented by the symbol %. With the above data how can we compare your progress in Mathematics in a year? You must have thought why not conduct examination for 100 marks always, so that comparison is easy. We can use percentage calculation to measure the progress. We conclude that marks scored in mathematics are 60%, 65%, 68% and 70%. Since the tax rates are different for different amount, this taxable income needs to be split as 1,00,000 and 2,00,000. We also need to be calculate tax separately on these two amounts. 10.2% of 400000 = (10.2/100)* 400000 = 40800, which is the total tax to be paid by the individual. 4.1.1 Problem 3: The population of a town is 24,000. If the number of males is increased by 6% and that of females by 9%, the population would be 25,620 . Find the number of females in the town. 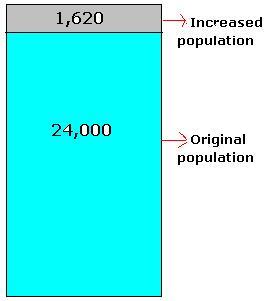 Thus the total population = original population + increase = 24,000 + 1620= 25620, which is as given in the problem. 4.1.1 Problem 4: Divide the sum of Rs 45,500 among three persons A,B, C in such a way that A gets (33)1/3% more than B and C gets 60% of A and B together get. You must have been to provision stores to buy daily requirements. The merchant sells items at a price to you after he buys same from the market or a producer of items. The price at which the item is sold is called ‘selling price(SP)’. In order to sell items to you, he has to buy these items from some one, may be from a producer or from another merchant. The merchant has his own expenses (He pays rent for the shop, pays for electricity bills, and pays salary to employees…). For this reason the seller has to sell items at a price more than the price at which he has bought the items. The extra money he gets is difference between selling price and cost price. It is called profit. There can be situations where a merchant wants to get rid of old stock of items. In such cases, he may sell items at a price less than the purchase price. In such cases he incurs loss. Though we may buy items in smaller quantities from the merchant, the merchant always purchases items in large quantities. Since the merchant buys in large quantities he gets some reduction in prices from the first (original) supplier. Whole sale price is always < Retail Price. He wants to make more profit. For that, he is not sure whether he should sell more biscuits or more chocolates. Since you are a student of mathematics he wants your advice!. What will you suggest to sell more chocolates or more biscuits? he got a profit of 1Rs. he got a profit of 3Rs. he gets 5 Rs(=15-10) extra if he sells biscuit packs. 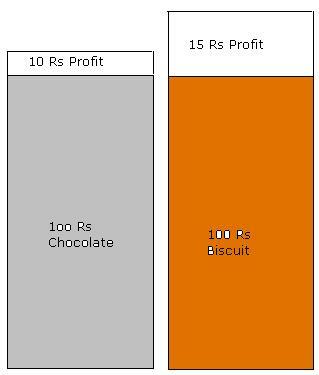 Thus it is profitable to sell more biscuits than chocolates. What did we do? In both the case we arrived at his profit on sale of 100Rs (%) to Cost Price (CP). The ‘profit percentage’ is the profit made on a Cost price of 100Rs. The ‘loss percentage’ is the loss made on a Cost price of 100Rs. 4.1.2 Problem 1: A grocer mixed 3 kg of tea powder at Rs 180Rs per kg with 2kg of tea powder at Rs.130 per kg. If he sells the mixture of two at Rs 192 per kg. Did he make profit or loss and what is the percentage? By mixing tea powders he will have total of 5 kg of tea powder. 4.1.2 Problem 2: A coconut seller purchased 1000 coconuts for Rs.6000. Unfortunately 100 coconuts were rotten. He sold remaining coconuts at Rs each. Find the profit %. Since 100 coconuts were rotten the seller was left with only 900 coconuts. Since SP> CP he has made a loss = CP-SP =6000-4500 = 1500. Selling price of papaya(SP) = 2.50*12 = Rs 30. Profit % = Profit*100/C.P = 10*100/20 = 50% which is the gain as given. 4.1.2 Problem 5: If a vegetable vendor sells 10 Kg of beans at Rs71.25 and incurs a loss of 5%, What is his cost price? Loss % = Loss*100/C.P = 3.75*100/75 = 5% which is the loss% as given. SP = (100+Profit %)*CP/100 when there is a profit. SP = (100-Loss %)*CP/100 when there is a loss. 4.1.2 Problem 6: Let us understand how an item manufactured by a manufacturer reaches a buyer. Firstly, the item is manufactured by a manufacturer. Then, the manufacturer sells the items to a Wholesale merchant. Then the wholesale merchant sells the items to retailers. Finally retailer sells the item to Buyer. A manufacturer gains 50% on each item when an item is sold to a wholesale merchant. Wholesale merchant gains 25% on each item sold to retailer. Retailer gains 10% on each item sold to a buyer. If cost of manufacturing an item is Rs 200. Find out the price paid by an individual. We need to find SP of an item by Manufacturer, Wholesale Merchant and Retailer. 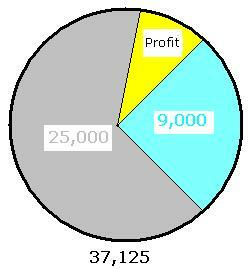 Profit % = Profit*100/C.P = 37.5*100/375 = 10% which is the gain as given. Profit % = Profit*100/C.P = 75*100/300 = 25% which is the gain as given. Profit % = Profit*100/C.P = 100*100/200 = 50% which is the gain as given. 4.1.2 Problem 7: By selling an article for Rs 23 a man lost 8%. At what price should he sell it to make a profit of 10%?. What is the cost price of the article? Since man has lost 8% by selling at Rs 23. 4.1.2 Problem 8: A merchant purchased 1000 cucumbers for Rs.3800.He paid 2% tax and spent Rs.50 on transportation.40 of them were spoiled. At what price should he sell the remaining to gain Rs.1114 on the whole? Since we want to know his SP, first we need to calculate the CP. The CP should include his purchase price, tax and transportation. 4.1.2 Problem 9: A man sells a TV set for Rs 6900 and makes a profit of 15%. He sells a second set at a loss of 10%. If on the whole he neither gains nor loses, find the cost price of the second TV set. Since in all he does not make any profit or loss, it is clear that he incurs a loss of Rs 900 while selling the second set. Thus the cost price of second TV set is Rs 9000. 4.1.2 Problem 10: A man bought two transistors which costed him Rs 720. He sold one of them at a loss of 15% and the other at a gain of 19%. If the selling price of both transistors is same find the cost price of each transistor. Let x be the cost price of first transistor. The cost price of second transistor is 720-x. Verify that above working is correct.